The organ was built in 1908 by Norman and Beard and has been virtually unaltered since then – it has been described as a “Rolls-Royce” organ of the time. The action is tubular pneumatic. The organ has three manuals and a pedal board, with 26 speaking stops and about 1400 pipes. It is tuned regularly and maintained in good repair. In 1992 extensive work was carried out to renew many of the small leather pneumatic motors, which form an integral part of the action. In 2003, the main blower failed and was replaced with two new blower fans (after the initial replacement, it was found that one by itself was not powerful enough). In the summer of 2006, a humidifier was fitted, to alleviate the problems experienced in recent years due to the woodwork and leathers drying out when the church heating is on. 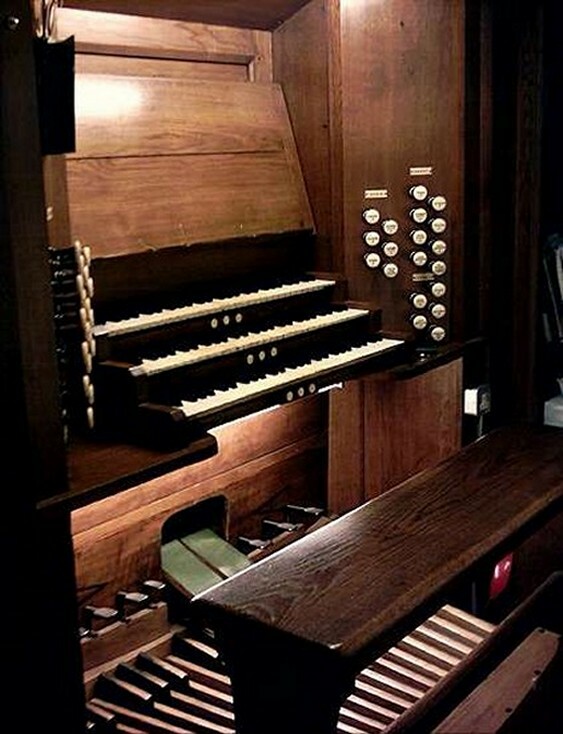 Also, later in 2006, a CCTV system was introduced to allow the organist to see what is going on – up to now, as the console is hidden behind a pillar, the organist has had very limited visibility of the proceedings. He can now choose to view the back of the church, including the two entry doors, or the dais with the nave altar at the front. Each manual has three pre-set thumb pistons (for quick selection of stop combinations), and the Swell pistons are duplicated by foot pistons. The Pedal Organ also has three foot pistons, and the Great and Pedal pistons can be coupled together. The Great to Pedal coupler is also duplicated by a foot piston. Swell and Choir Organs are both enclosed, each with a swell pedal.